Workshop report: Building science to advance research in the microbiology of the built environment – microBEnet: the microbiology of the Built Environment network. While recent studies of the microbiology of the built environment (MoBE) have greatly increased our understanding of microbial community structure and composition on surfaces and in air within the spaces in which we live and work, most have been driven and led primarily by microbiologists with the building science community playing a supporting role. Perhaps as a byproduct of this arrangement, these recent studies have varied quite widely in their characterization of key building details and in the overall implications of their findings in relation to how buildings are designed, built, and constructed. Now that the MoBE field has firm footing grounded in microbial ecology, it is my opinion (and the opinion of many other colleagues of mine) that it’s a good time to solicit input from expert building scientists, engineers, and other disciplines that make up the building science and engineering community on the overall effectiveness of these previous studies for advancing knowledge of microbial communities in the indoor environment, to identify existing gaps in these studies from the perspective of “building scientists”, and to inform a research agenda for future studies of the microbiology of the built environment that stems from deep knowledge of how buildings are constructed, operated, and occupied. I was fortunate to be able to host a small workshop at my university (Illinois Institute of Technology) in Chicago in May 2014, supported by the Sloan Foundation’s MoBE program. 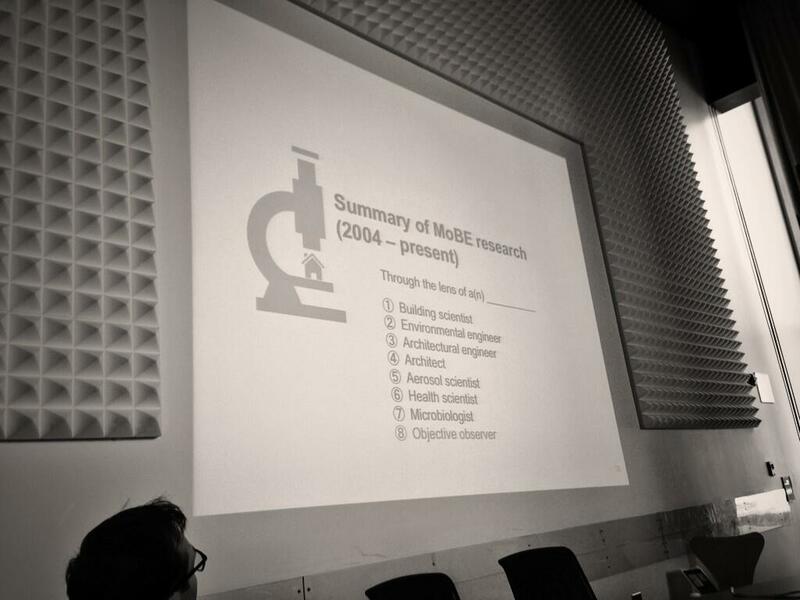 The workshop was called Building science to advance research in the microbiology of the built environment (MoBE). The one day workshop was designed to bring together a group of experts in building science and engineering with a smaller number of microbiologists and microbial ecologists to discuss existing gaps and future opportunities for research on the microbiology of the built environment. Goals of the workshop were to advance the Sloan MoBE program’s research agenda and ultimately work towards increasing efficiency and impact among Sloan grantees and others by facilitating interdisciplinary discussions. The details of the workshop are described in full in a recently completed Workshop Report and Meeting Transcript, but here I will briefly mention the workshop events and summarize several recommendations for future work in the Sloan MoBE program and the MoBE field in general that resulted from the workshop discussions. The agenda began with an introduction to the Sloan MoBE program and the genesis of the workshop by MoBE program director Paula Olsiewski. Yours truly then followed with a review of recent MoBE research findings from two particular perspectives: (1) that of an objective observer stumbling over recent papers in a library that have evaluated microbial communities in indoor environments using molecular methods (i.e., “what does this all mean?”), and (2) that of a building scientist summarizing these same papers in terms of how much or how little building environmental data had been measured alongside microbial data and what greater built environment data can allow in terms of extrapolation to other environments (i.e., “what does this all mean for building design or operation?”). Much of this review is covered in detail in our recent paper in Building and Environment (also mentioned in a recent post by Jonathan Eisen here on microBEnet). There remains a need for better methods for microbial quantification and the identification of other quantitative metrics, particularly those that may be more relevant to health (e.g., viability, metabolic activity, allergenicity, etc.). There remains a need for smaller sample size intervention and controlled environment studies that focus on fundamental processes (e.g., emission and survival) and transport and dispersal mechanisms, which can also be used to elucidate impacts of important built environment factors (e.g., ventilation, environmental conditions, filtration, occupancy characteristics, and others). More broadly, there is a need to improve study designs in terms of achieving specific goals for informing building applications. There remains a need to begin engaging other sources of funding, including those in the building design, construction and operation fields and public health, including NIH, NIOSH, HUD, ASHRAE, DOE, AHRI, and others (including piggy-backing with existing health studies where appropriate). This may also benefit from starting to increase knowledge transfer and awareness in these communities. There remains a need to continue to increase communication between microbiology and building science communities, as well as to begin integrating with health scientists. Also, more interdisciplinary workshops should be pursued, including potentially: (1) a cross-disciplinary hands-on workshop where fields learn each others’ methods, terminology, and tools, and/or (2) a similar workshop to the one described herein, albeit with more engagement with practitioners and other important stakeholders. There remains a need to continue to improve standardization in sampling methods, including microbial methods for both air and surface sampling and built environment data collection. Standardization must include flexibility for study design and future method developments and applications. There remains a need to explore connections between indoor microbiology and chemistry. While not an exhaustive list, beginning to address these broad priority areas is expected to lead to increased efficiency and usefulness of MoBE studies and better elucidate the connections between building design, operation, and occupancy, indoor microbiomes, and human health. I urge you to read the full Workshop Report and Meeting Transcript if you are interested. This workshop was made possible with funding from the Alfred P. Sloan Foundation (Grant no. 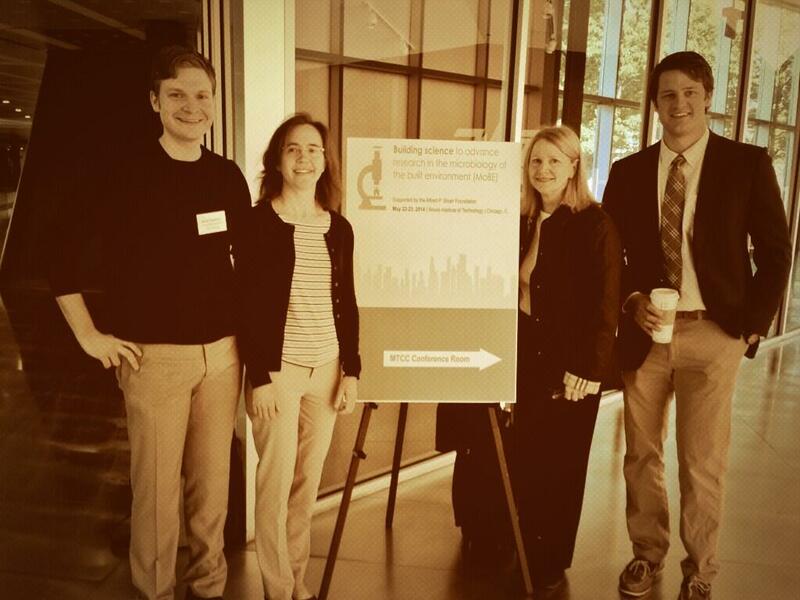 2014-5-02 MBE) and I am immensely grateful for Paula Olsiewski and the Sloan Foundation for supporting this workshop. I am also thankful to all of the workshop participants for their discussions before, during, and after the event, as well as to other members of the fields who could not attend with whom I have discussed this workshop and its outcomes (including Rich Corsi, Kerry Kinney, Jordan Peccia, Terry Brennan, and many others). Finally, I am grateful for the efforts of those internally at IIT who helped make this workshop possible, including Edoarda Corradi, Tiffanie Ramos, Parham Azimi, Stephanie Kunkel, and Clarice Echols.